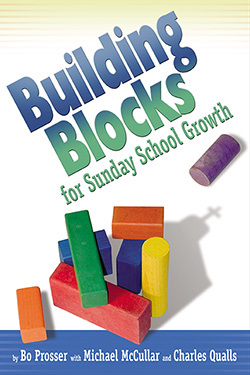 Building Blocks for Sunday School Growth are at your fingertips. These six building blocks: Vision, Balance, Leadership, Relevant Teaching, Receptivity and Inclusion, and Outreach and Inreach, will help you develop an intentional vision and plan for spiritual and numerical growth. The authors contend that failure to pay attention to the infrastructure in these six areas can lead to a decline in the quality of your Sunday school. However, by focusing on these six building blocks, you will re-energize your leaders and allow your Sunday school to grow and develop. As you gain a renewed perspective on the potential of Sunday school, you will notice an increase in energy, both spiritual and numerical. The critics are wrong— Sunday school is not dead! Strengthening these six areas of your organization can lead to a renewed Bible Teaching Ministry. Your Sunday school can grow, and as the Sunday school grows, so, too, will the church. Bo Prosser is the Associate Pastor/Adult Educator at Providence Baptist Church in Charlotte, NC. He is also the Director of The Center for Christian Education and a nationally recognized author, speaker, trainer, and consultant for churches, nonprofit institutions, and corporate organizations. Charles Qualls is the Associate Pastor for Pastoral Care at Second-Ponce de Leon Baptist Church in Atlanta, Georgia. He earned his bachelor’s degree at West Georgia College in Carrollton, his Master of Divinity degree in Family Ministry/Christian Education from Southern Baptist Theological Seminary, and his Doctor of Ministry degree from Mercer University. "A refreshing look at a traditional tool for reaching and growing people and churches. The authors help leaders retool for effective Sunday school in changing times."